Following the election of Donald Trump, I was not discouraged. I wasn’t even particularly interested, as if I was watching a TV show featuring a car wreck rather than actually living through one. I even a wrote a short story that appeared in the City Paper, Victory Party, that was sympathetic to the misguided wishes of Trump supporters. Once in office, I assumed Trump would be a new and better man, cognizant of history and burdened with global responsibilities. His derangement is such a weird outlier in American history that our system doesn’t know how to respond. What do you do if the king is mad? It’s a problem more out of Shakespeare than anything written in the Constitution. Engulfed by scandal, a rational man would resign. A rational party would step in and force him to do so, like the Republicans did during Watergate. Instead, Washington is powerless, the will of one man dragging the country into a political abyss from which both parties, and the country as a whole, will be irrevocably changed. Not even six months in office and Trump recently held his first reelection fundraiser. Shamelessly, it was held at the Old Post Office, a historic building that he’s trimmed with gold and slapped his name on, the Emoluments Clause be damned. On the street, a few dozen protesters, their focus being on the repeal of Obamacare and its replacement with the rump plan of Trumpcare. There were two Trump supporters. The first, a homeless man who revived from his drug-induced stupor to stagger across the sidewalk and demand that we respect the President. The second, a tourist who shouted her love for Trump before her husband led her away. 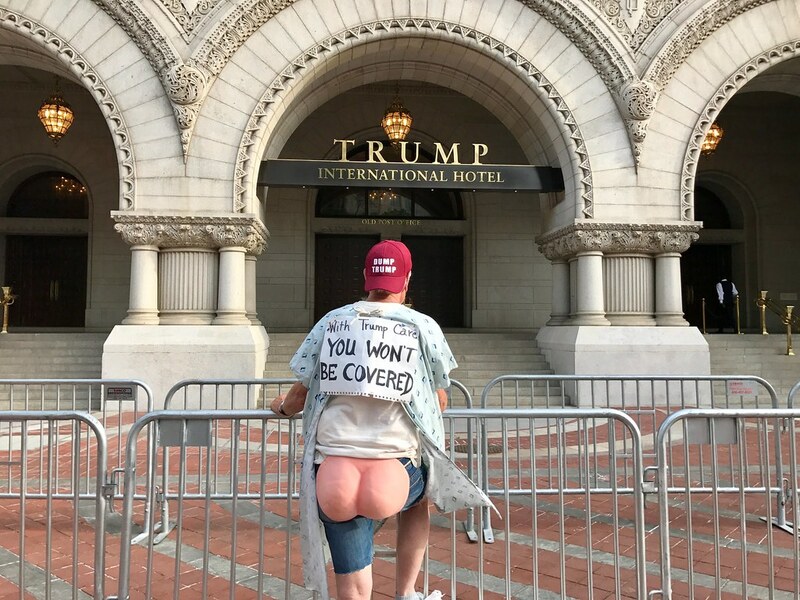 The Presidential motorcade drove by, as if the protesters and supporters didn’t exist, their cries rising up to an empty sky, the interloper slipping into the grand old building that belongs to the public. I took a few photos of the motorcade. I could see the Presidential seal but not Trump himself. I deleted the photos. Didn’t want them. In ancient Rome, some rulers were so awful that their reigns were erased from history. Nobody wanted to remember them. Their temples were destroyed. Their burial places hidden. Their names scratched off monuments. When this ends, and it will end, there will be a similar effort. If America had an undo button, we would hit it. Instead, we will try to pretend that this never happened, like the ex-wife nobody talks about or the house guest that stayed too long. Of course, we won’t forget – nor should we, this hard lesson in democracy. Washington, DC, has a raw, unfinished quality to it. The Presidential reviewing stand is still up on Pennsylvania Avenue, as the National Park Service disassembles it with their usual lethargy. The site is surrounded by chain link fences, adding to the type and variety of barriers that encircle the White House – yellow caution tape, red wooden snow fences, concrete bollards, decorative planters, metal car barriers that pop up and, of course, the historic wrought iron fence that has proven to be so easy to climb. 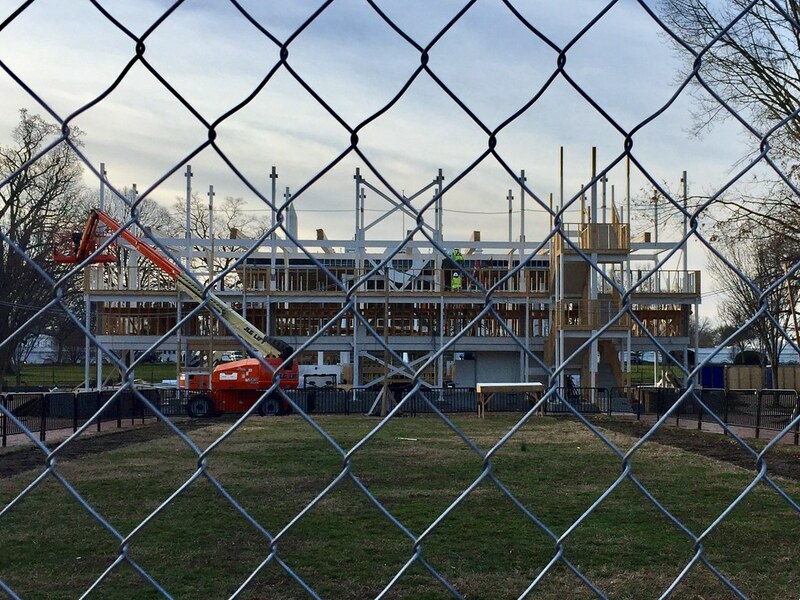 Behind these walls, a couple of orange-hatted construction workers toil at disassembling the reviewing stand by hand, while observed by a platoon of heavily armed Secret Service agents. Work isn’t expected to be completed until March. On the other side of the White House is the empty spire of the Washington Monument. It’s closed until Spring 2019, due to an elevator problem. We’ve fought and won wars in less time. It’s a symbol of America but is not a priority to Congress, who is more interested in taking things apart than fixing them. Looking out on this tableau of dysfunction is Donald Trump. Brooding, tweeting, as he wanders the White House in a bathrobe. He doesn’t think to right the broken things around him. Instead, he conspires to break more things, appointing a parade of loathsome incompetents to high office – Steve Bannon, Sean Spicer, Betsy DeVos. I wrote a novel called Don’t Mess Up My Block, the thesis of which is that you have to fake it until you make it. In this satire of a self-help book, a loser reinvents himself as a management consultant, despite having no qualifications or experience. With the blind confidence of a conman, he goes from Dinkytown obscurity to DC success. Even with my fevered literary imagination, I never thought a conman could take over the federal government. What this city needs is a good snowstorm. Today, it’s 65 degrees. I’m in a coffee shop by the White House. The air-conditioning is on. Outside, tourists walk by in shorts and t-shirts. We need a blizzard, something to remind lawmakers of the power of Mother Nature to silence them all. A storm that shuts the city down for a week (like the one that occurred last year) might instill some humility in these cruel powerbrokers. But that’s not going to happen. Winter is nearly over. Rescue is not coming. “At some point, the adults will step in,” I assured myself during the election. Party elders. The media. The wisdom of the American people. Someone would save us. We’re going to have to save ourselves. Humor is a good start. The parody of Sean Spicer by Melissa McCarthy did more to shape the public view of the administration than hours of talking heads on CNN, revealing the Trump regime’s bullying and incompetence. Humor is subversive, an effective tool targeting tyranny and freeing people from fear. 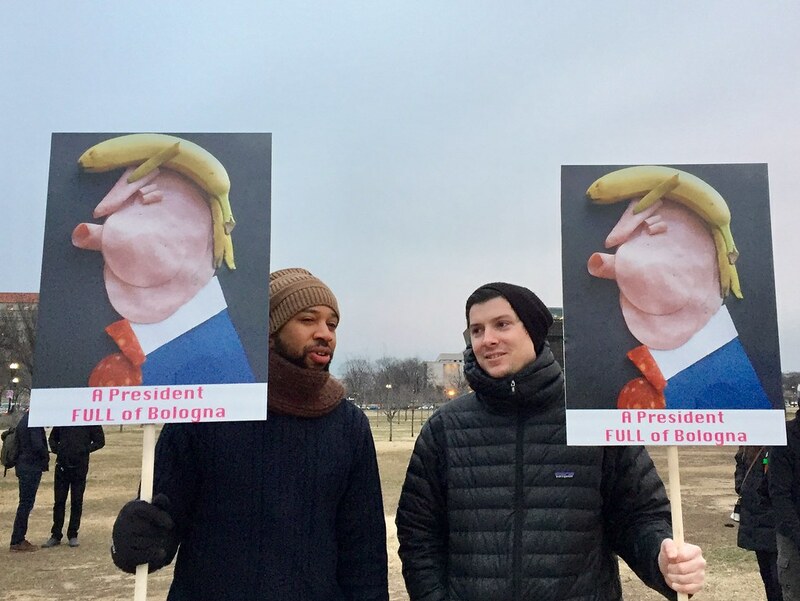 There’s a reason why anti-Trump demonstrations in DC feature so many hilarious signs – the people sense it’s working, these little pinpricks getting under the skin of delicate Donald and his supporters. How does this all end? Mass demonstrations began the moment Trump was inaugurated. And they’ve continued despite seasonably cold weather in DC. Six major marches are coming this spring, from everyone from outraged scientists to outrageous juggalos. If I was the city government, I would prepare for a million people to descend upon Washington, mass demonstrations of a size and scope not seen since the Vietnam War. And if I were demonstrators, I would lay siege to the Old Post Office on Pennsylvania Avenue. The General Services Administration foolishly leased this grand building to Donald J. Trump, who garishly affixed his name to it in gold. But this landmark belongs to the public, who saved it from demolition in the 1970s. 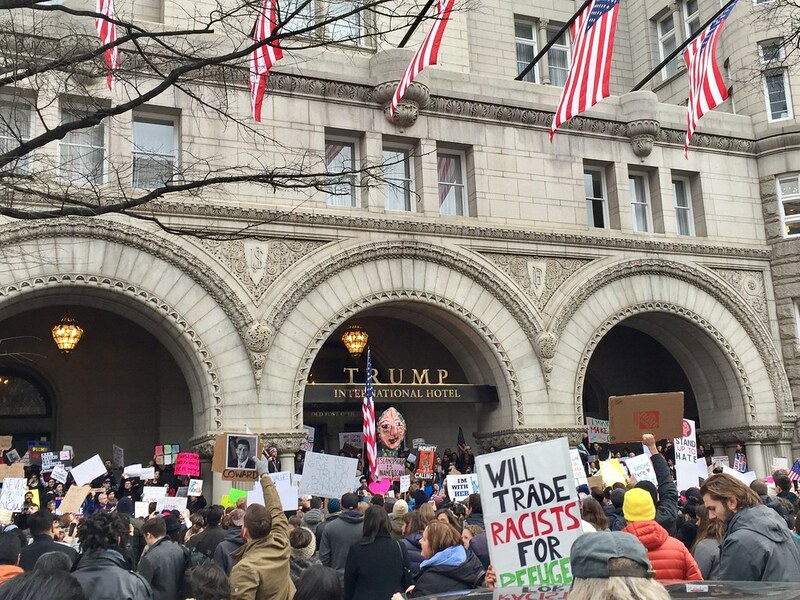 Trump does not belong there; the Old Post Office belongs to us. And, unlike the White House, the so-called Trump International Hotel is not ringed by fences. The Old Post Office is open to the public and right on Pennsylvania Avenue. It is vulnerable and should be the focus of demonstrations. Surround the Trump Hotel. Discourage stays there. This would hurt Trump in his pocketbook. And, more importantly, his pride. Destroy the Trump brand. Make it mud. That’s how you drive this particular tyrant from office.